Dubai, UAE, February 04, 2018: In a seamless union of ancient and modern elements, the Rado HyperChrome Chronograph Automatic is now available in a beautifully contrasting bronze and high-tech ceramic construction. Limited to 999 pieces, this exclusive timepiece joins two materials that are perfectly suited for use in watchmaking: Bronze, which marks the passage of time by developing a rich patina, and high-tech ceramic, which boasts lightness and superior scratch resistance. 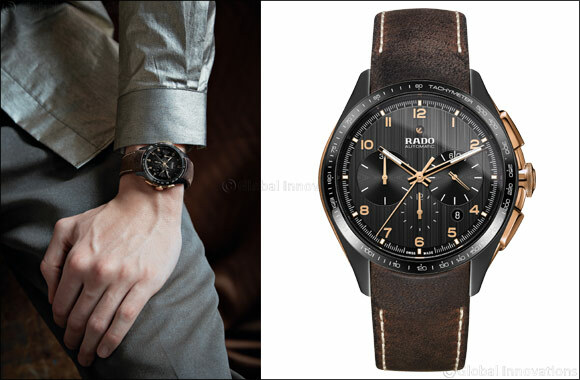 The sporty-chic HyperChrome Chronograph is Rado's signature all day, every occasion timepiece for gents. In this new model, the 45 mm automatic chronograph retains its scratch resistant high-tech ceramic case – here in matt midnight black – but swaps out the ceramic bracelet for a supple brown vintage look leather strap. 'A need for true matter is driving designers to reach out for unusual directions, wilder ideas and primitive ingredients such as lava, metal and bronze,' observes renowned trend forecaster Lidewij Edelkoort. As the Swiss watchmaker known for its pioneering use of materials, Rado worked in the same vein, combining the ancient beauty of bronze with the modern technical achievement of high-tech ceramic. The result is the bronze edition of the HyperChrome Chronograph: a striking combination of old and new, and a watch that honours the passage of time both inside and out.